Nimbuzz following on top of last night's release of push notifications for their Apple iPhone app has today just released a Mac version of their popular IM/VoIP aggregator application. Nimbuzz supports Windows Live Messenger (MSN), Yahoo, ICQ, AIM, Google Talk, Facebook, MySpace, and more. You can download the Mac client here. \nNimbuzz following on top of last night's release of push notifications for their Apple iPhone app has today just released a Mac version of their popular IM/VoIP aggregator application. 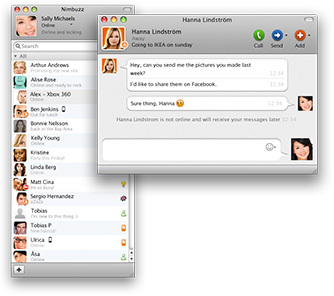 Nimbuzz supports Windows Live Messenger (MSN), Yahoo, ICQ, AIM, Google Talk, Facebook, MySpace, and more. \nYou can download the Mac client here.